Everyone talks about time management and morning routines. Take a look at Pinterest. There are pins and blog posts about how to structure your day and manage your time. Even I have written on how to use Google for block scheduling, and how to block out your time at work. Most of the advice out there, while well-intentioned, is missing a larger piece of the puzzle. For example, my time blocking system will not necessarily work for everyone else. And if I try to copy the routines of a time management expert I will undoubtedly fail. Why? 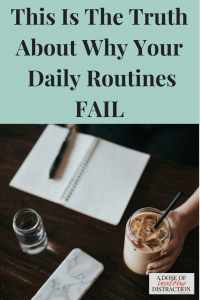 Individualized routines are the key to managing our time and gaining a sense of control over our crazy lives. Here are some ideas to get us started. Different types of situations require different types of routines. If you stay at home and you need to develop a housekeeping routine, that is different than the routine you would develop in order to be productive at work. Personally, I need a routine for everything or I will forget something. Not sure if this is an ADHD thing or what, but if my routine is off I am out of sorts. My planners, both paper and online also play a major role in my routines. Keep in mind, having an evening routine in place might actually make your morning routine that much easier. And not every routine has to be 25 steps long. Whenever you are trying to create a new routine you need to break the activity down into individual steps. This helps you to see which steps will require the most time. You could continue with white clothes etc., but I think you get my point. Think about how often will you complete your laundry routine. Twice a week? Three times? In my house I do laundry at least 3 days per week. If you have a larger family you will probably have to do it more often. Once you have your list of steps from above, try to guess how long each step takes. Just estimate, it doesn’t have to be perfect. You are trying to determine how long it will take you to complete your new routine. For me to do 2 loads of laundry start to finish and put it away, it would probably take about 3 hours. Determining how much time is required to complete your routine is essential. First, because we all have a different natural working pace. Second, because it is easy to get distracted along the way. If you use a planner you will want to block off some time to complete your new routine. This step is vitally important for accountability. What is the first thing you do when you crawl out of bed in the morning? For me, the answer is that I stumble into the bathroom to pee. If I were trying to develop a routine where I brush my teeth first thing, I would take that trip to the bathroom and add brushing my teeth. To make sure I don’t forget I could put a Post-it note on the mirror. Or I could put my toothbrush and toothpaste out on the sink so I see them as soon as I walk in the bathroom. My point here is to take some already existing habit, and piggy back onto that to kickstart your new routine. If you want your routine to stick it has to become a habit. Which means you have to commit. Using the first example above, you could decide to do laundry 3 days per week. Since you know you need about 3 hours each time, you could block off from 9 a.m.-12 p.m. in your planner. This allows you to schedule something else later in the day. Start by developing a routine for one area of your life where you are struggling. Incorporate your new routine into your daily/weekly planning. Remember, routines only work when they are individualized. Do you struggle with creating routines that work?